Standard TF-IV. Assessment and Evaluation. Educational technology facilitators apply technology to facilitate a variety of effective assessment and evaluation strategies. A. Apply technology in assessing student learning of subject matter using a variety of assessment techniques. My staff sessions began with a session on Edmodo where teachers were introduced to this format of an online classroom. Through Edmodo, students can participate in online discussions on any given topic. During these discussions, I give students credit for participating, and extra points for contributing thoughts which bring together the thoughts of others, or go above and beyond the parameters of the topic. Edmodo has also created badges which can be awarded to students for participating or exemplary discussions. After my Edmodo session, a group of teachers has used Edmodo extensively in their classes as a way to give multiple choice and fill in the blank tests and quizzes. The quizzes are graded electronically, and the teacher can choose to have the students get immediate feedback or not. 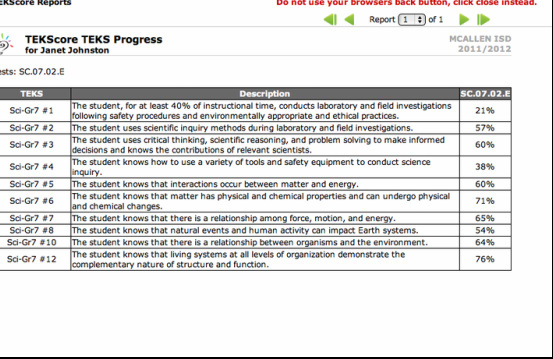 Lastly, the grades are recorded within Edmodo and teachers can return the students' grades electronically. Google Docs has several assessment tools within the spreadsheet section that are easy for teachers to use. After conducting my first 3 sessions, I created a survey for staff members so I could evaluate the sessions and determine what steps to take next. I sent the survey to not only those teachers in attendance but also the teachers who had indicated interest but did not attend. I had sent all of these staff members a copy of my presentation via email after the session. Unfortunately, the responses for this survey were few in number, but I was able to gather information on the success of the Edmodo session and determine the need for more information about general apps for use in all classes. Through these surveys, I have also shown the teachers how to use Google Docs as a method of assessment for their students, and a select few have tried them in class. In addition, I have informally shared both surveys and google docs flashcards with teachers within both my previous and current schools. The flashcard app found within the spreadsheet section allows students to practice their own knowledge with flashcards created by their teacher, or themselves. The student can assess their own progress easily and continue to work until mastery on a given topic. A sample of Digestive System Flashcards can be viewed here. In Texas students are given district benchmark tests three times a year to assess student knowledge on the topics taught during the school year. In science, this is particularly helpful when planning the review for 8th grade students before they take the state science test. Since this test is only given during 8th grade, but based on the standards taught during 6th, 7th, and 8th grade, it is crucial that the review sessions place an emphasis on standards not previously mastered. As a science department, we meet regularly to discuss standards not mastered. The results of these tests are stored within a program called DMAC, and each teacher has an account giving access to their students. The results for 8th grade students can be accessed, and the standards that demonstrate mastery are given less emphasis during the after school and Saturday reviews. Standards needing more review are emphasized during the review sessions, which all students are encouraged to attend. in order to further prepare the students for this 8th grade cumulative test. _Edmodo has the poll option, which I have demonstrated in my PD sessions, as an informal means of assessing student knowledge at the end of a class period. The poll responses are anonymous, so any student can claim confusion on a topic without anyone else knowing. In this way the teacher knows to reteach some or all of the content. Polls are easily created within a class period, and the results from each class are kept separate so that students can form their own answers. Polls can be based on an opinion or fact, based on class discussion topics. This is a great way to get input from all students at the end of a class period. The student can share their knowledge quickly, and the teacher can use the results to reflect on the need for reteaching a topic, or gather data on possible student misconceptions that need clarification. C. Apply multiple methods of evaluation to determine students' appropriate use of technology resources for learning, communication, and productivity. In ET 630, I created a Selective Breeding Unit and lesson plan that instructs students on the benefits and limitations of genetic variation among sexually reproducing organisms while analyzing Web sites for credibility. Within this lesson there are several different applications of technology that allow the student to communicate with others and allow the teacher to evaluate the student's knowledge. The lesson begins with students researching a genetically altered organism, which is completely false. After a class disussion, students use Survey Monkey to give opinions of the accuracy of the sites they have viewed. Students then examine several sites, including a Wikipedia entry, and use Survey Monkey again to review the accuracy of those sources. At this point the teacher has a good understanding of how critically the students are examining the sites for accuracy. In the next section of the lesson, students then research their choice of organism while analyzing pre-selected Web sites for credibility. Students use a blog to share their knowledge and together as a team create a summary of the characteristics and background of their organism. Students are evaluated on each website evaluation and contributions to a blog.